His father is English and his mother is Chinese. His father left the family when he was 4 years old. 1 Oct – Actor Anthony Wong expressed his anger over the recent occurrence that involves the police and protesters. According to a report on HK Top Ten, the actor turned to Facebook to express his fury after hearing the police announcing the deployment of 7000 officers and the use of 87 tear gas canisters against unarmed students and citizens to end the protest two days ago. He wrote, "That's enough for a war! Do the protestors have any weapon? Are they Wong Fei Hung, who can use a minor thing like an umbrella as a weapon?" "87 tear gas bombs against umbrellas... Hong Kong is truly amazing. Amazing!" he said. He continued mocking the police, saying, "This just in, due to the effects of Occupy Central, the 1 October fireworks show has been cancelled and will be replaced with the launch of tear gas and smoke bombs! Don't forget to bring your umbrella when you go out!" Well,now i in Hong Kong ,they still protest . this site seem blocked in Guangdong . Admin are you from China? chinaman : No I'm not. But I've been living in China for 7 years now. In Beijing to be exact. Are you in Guangdong now? Well i not from Guangdong ,i from United States,my parent are from Hong Kong . I went to Guangdong for working trip ,not on holiday . I just pass by Hong Kong and now i in Kuala Lumpur for other working trip . I will went back to United States on Wednesday. Wuxiasociety are sOME how blocked in hotel i stay in guangdong. Are you from Malaysia,apa khabar? I like this guy in The Justice of Life when he act as baddie ,he also act in a movie which he made bao from human . 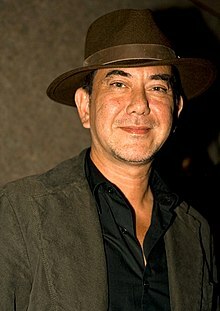 Back to Anthony Wong : he has a pyschopat smart look. He's kinda like Anthony Hopkins who is very good as Hannibal Lecter.